Smartphones have become quite good cameras, and manufacturers continue to emphasize their resolution, lens quality, and auto exposure features. But we know what these cameras really are about -- taking selfies (see Wikipedia)! It turns out that lots of people are interested in shooting self-portraits -- in the bathroom mirror, and more typically by holding the camera at arm's length, sometimes even against an interesting background. Smartphones accommodate this natural impulse by including both front- and back-facing cameras, so we can preview the shot on the screen. But there's only so much you can do in composing a great photo at arm's length, so the next step is to add a remote shutter control like the AudioVox Shutterball for more stable images, with a bigger view for group photographs. The Shutterball is a small plastic ball (1 1/4 inches) that communicates via Bluetooth to your smartphone -- Just press the button to shoot photos and videos from up to 30 feet away. It works with the free Shutterball app for iOS or Android (and not your built-in camera app), which provides quick shooting options for photo and video, using the front or back camera. It comes with an attached loop to carry on your jeans, bag or keychain. And the product includes a mini stand/easel to prop up your smartphone. The Shutterball runs on a pre-installed coin cell battery that lasts up to 5 years. The AudioVox Shutterball is available for $19.99, in pink, blue, green, or black. The IN1 Multi-Tool Utility Case is the Swiss Army Knife of smartphone cases -- literally. It's a standard slide-on case to protect the back and sides of your phone, with the addition of a variety of tools that you expect to find in a multi-tool knife (OK, except the knife blade). The polycarbonate case is stuffed with six tools down the side -- with flat-head and phillips screwdrivers, nail file, tweezers, scissors, and toothpick. And there's two ball point pens in the top, so you're never short of either blue or red ink. Plus the case has an integrated kickstand in the center, so you can prop it up to share the display in widescreen mode. The IN1 Multi-Tool Case for the iPhone 5 and 5s is $44.95, with Samsung Galaxy S4 coming soon. It's available in white and black, and clear to show off the embedded tools. The tool also come in six bright colors. It's a clever way to carry all those handy tools, especially when a knife may not be welcome. The company even reports that the Multi-Tool Case is TSA compliant. The Luci Solar Lanterns from MPOWERD were designed to bring affordable and clean solar lighting to remote places and people. The result is a clever design that can serve as a bright task light, illuminating up to 10 square feet, or provide playful or mood lighting. 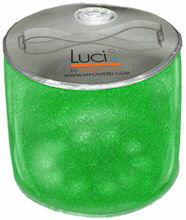 The Luci lanterns pack down to a disc that's 5 inches in diameter, 1 inch thick, and 4 ounces. But it's inflatable, so start puffing to expand it to its full 5 inches high. The other end from the valve has the solar panels. It fully charges in about 8 hours of strong sunlight, and then provides light for 6 to 12 hours (depending on the brightness level). The PVC enclosure even is waterproof, and can be immersed to 1 meter. The original Luci Light is only $14.99, and has three lighting modes: mood, bright, and flashing. The new Luci Aura is due soon, with a frosted body and colored lights, so you can select white, 6 different colors, or cycling. The result is easy, clean, and bright light. Entries posted to Manifest Tech Blog in February 2014, listed from oldest to newest.